Who benefits from Record Store Day? 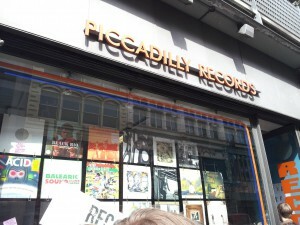 On 20 April, independent record stores up and down the nation took part in Record Store Day – an annual initiative of growing popularity designed to promote the re-emerging culture surrounding the vinyl record. But is the day working for fans and small independents? This year, the same year that HMV entered and was bought out of administration, saw Record Store Day in its sixth incarnation as an event aiming to promote the local music store in an industry that has become increasingly commercialised over the decades. 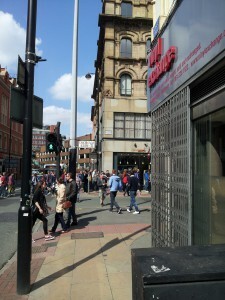 Here in Manchester City Centre, one HMV store remains, where once there were three. Meanwhile, in the city’s Northern Quarter, a number of independent music stores thrive, celebrating the crackly analogue sound of a record, the pirate-proof format, and perhaps a time when the music industry was a little simpler. That is the hope of Record Store Day – attracting many with its romanticism while revisiting a bygone age when individual shops took the hard-earned rewards. It’s noble, but not yet perfect. In practice it’s not all that fair. The day is supported by artists and record labels who release special edition singles, LPs, books, and cassettes especially for the day – and only to independent stores. Among this year’s offerings were Manchester band Everything Everything, David Bowie, Bob Dylan, Anthrax, Nick Cave, and a special rabbit shaped re-release by Chas and Dave. With around 450 other new releases, the choice was as eclectic as it was massive. However, some believe that the real profit is going to a select few record stores, while others miss out. Paul Evans, 50, who once worked in an independent record store, says that the event can, in some cases, be self-defeating. It is a thought shared by many others who joined the four hour queue outside Piccadilly Records at 8am on a Saturday morning, many of whom nervously checked a rolling Twitter feed to see if their desired purchase had yet sold out. Now a radiographer at Hope Hospital in Salford, Paul queued to buy only one record: OMD’s The Future Will Be Silent. Two hours in, he called his son to ask him to come into the city and renew his car parking ticket – desperate not to leave the queue and his hard-fought place in it. Another hour passed and the news arrived that the 10” OMD record had sold out. With good humour he left the queue, but it’s clear to all and a talking point with many that a number of smaller queues spread over a greater number of shops would be a fairer strategy. It’s a sentiment echoed by surrounding record stores, many of whom say that a change would be welcome. 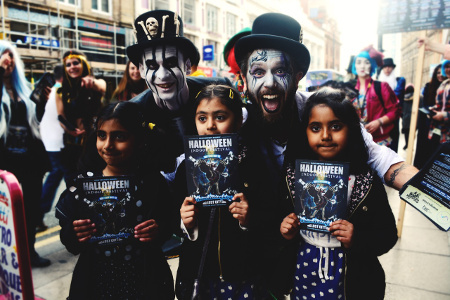 More than 200 stores took part this year, many of which ran additional events, DJ sets, and a near infinite number of novelties in the hope of having some involvement in the day. Despite having limited RSD stock, nearby Kingbee Records ran a 10 per cent-off campaign that they say was very successful. 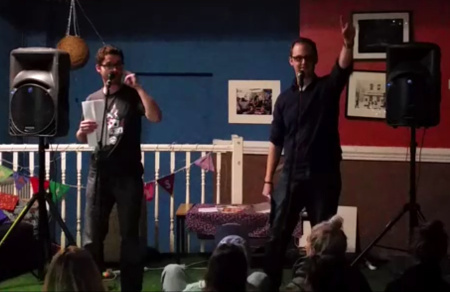 Meanwhile, Vinyl Exchange on Oldham Street worked hard to include themselves in the festivities, but, as store manager Richard explains, the official event overlooks them. That is another, probably more difficult problem to solve; an hour after participating stores opened their doors, the more popular of the day’s offerings were selling on auction websites such as eBay for a significant mark-up. By nine o’clock that morning, the 7” single released for the occasion by Foals, the chart-storming Oxford five-piece, was selling for £28 – at the time it was still on sale in-store for £5.99. 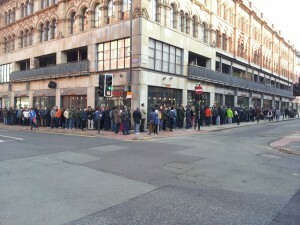 Similar to live concert ticket sales, it leaves a particularly bitter taste for the line of vinyl lovers (by opening time in Manchester they were queuing along three streets) that somewhere someone is benefiting more than the music lover. It would have been a particular annoyance for those few who began camping outside the store at half past nine the previous night. The hundreds of people who used their day off on a dull Manchester morning to join a queue that moved ten feet in its first hour will testify that the public’s commitment and enthusiasm to support independent traders is still there, but the commercial interest is as strong as ever. The organisation of Record Store Day will need to evolve and begin to help all local record stores if it is to show that it understands and avoids exploiting this enthusiasm.